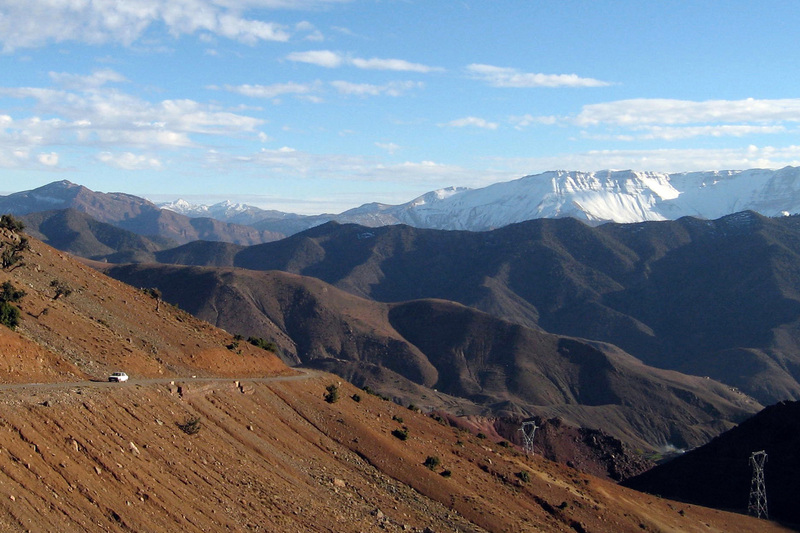 Over the years there’s been talk of a High Atlas crossing in 100-km span between the MH12 Demnate backroad (right) and MH1 via Agoudal. The 4000-m ridge of the Mgoun massif separates them. 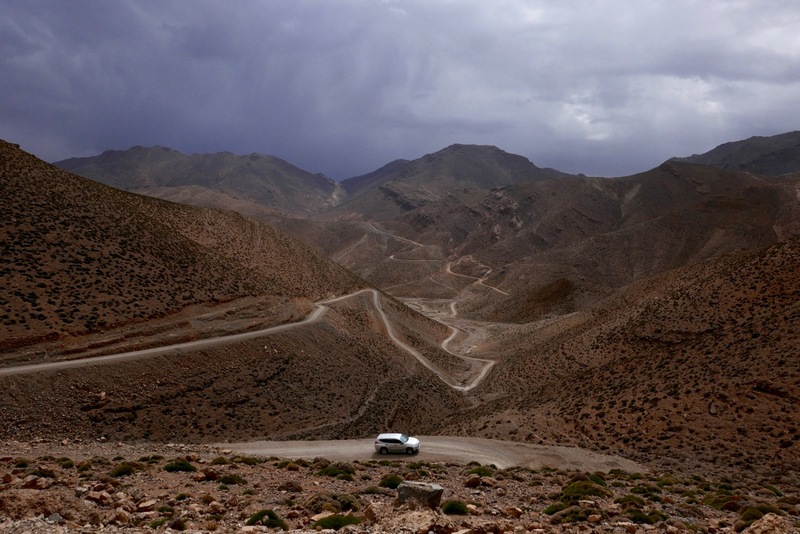 There are trekking trails which probably could be threaded together on a light bike, but now Moroccan road builders have completed what I’ve dubbed ‘MH19‘, a route usable in any vehicle as long as conditions allow. 1. Fork right, off the road at the top end of Alemdoun village (above left) for Ouzighimte, (aka: El Mrabitine). Southbound, just east of Tabant turn right (south) over the ford (right) for the easy 17-km climb to the Ait Imi pass. 2. Have a 200km fuel range. 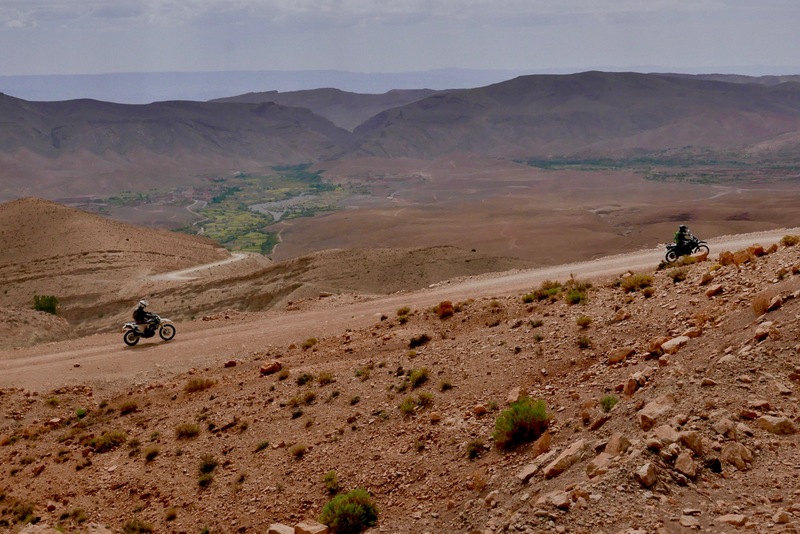 Elevation profiles show the road climbing steeply from the south up to the Aït Hamad pass, but the gradient on the entire route is never extreme, and as long as the surface remains smooth, the route is doable in a regular car or a fully loaded big adv bike. It took us 3 hours to ride the 80-km of piste from Alemdoun to Tabant, and about the same southbound in a 4×4. At Ouzighimte (aka Ameksar?) we chose the gorge route (right) instead of the new climb over the pass, a great diversion and the original route) which is still used by local Merc van buses. Coming north, turn off at the bend as you enter Amejgag village and wind your way north through the village to the gorge. 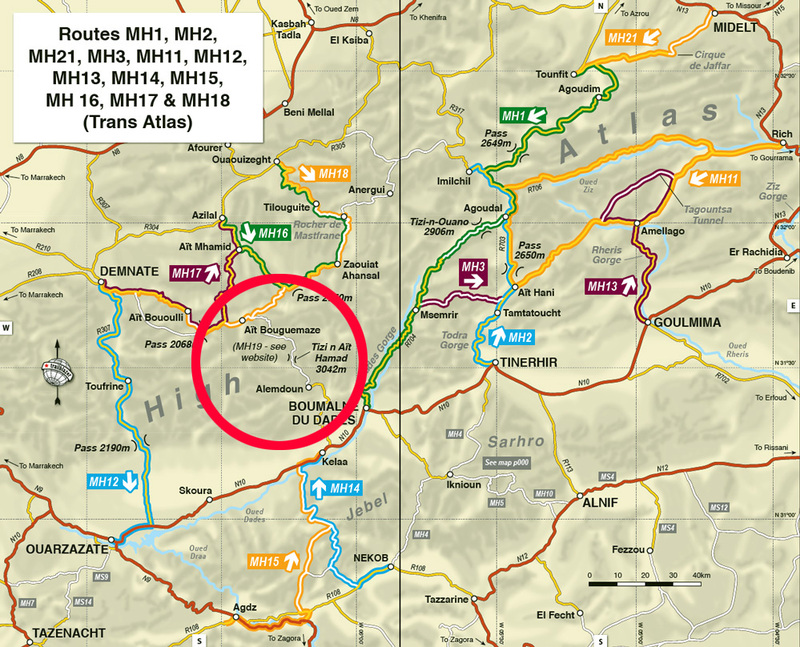 ‘MH19’ links the book’s two Jebel Sarhro west routes, MH14 and 15 which end near Kelaa, with routes MH16, 17 and 18 in the Aït Bouguemaze valley on the north slopes of the High Atlas. The route is sealed for the first 40km to Alemdoun (cafes, fuel at the shop if you ask; diesel 60dh/5L). On the way you’ll pass many Rose Valley auberges in the villages Kasbah Agoulzi recommended). At the end of Alemdoun, leave the road and keep right (north), not west with the tarmac. 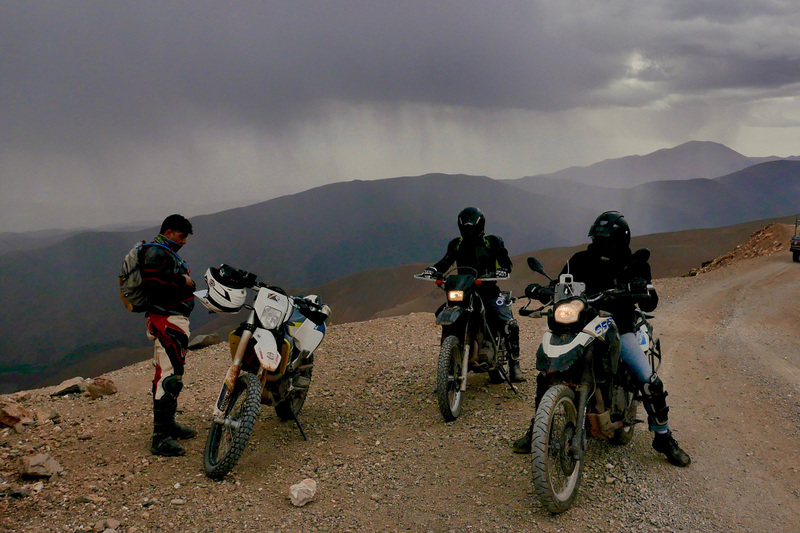 Now on the dirt, climb up to Amejgag village. Here the original piste splits right (east) to pass through the village and follow the Amejgag Gorge and the river north to join up in the Ameskar valley in about 10km. Most local traffic uses this narrow route. Otherwise, the new route takes you up to a 2350-m pass (right; KM50) before dropping down to Ameskar and joining the gorge route (KM56). 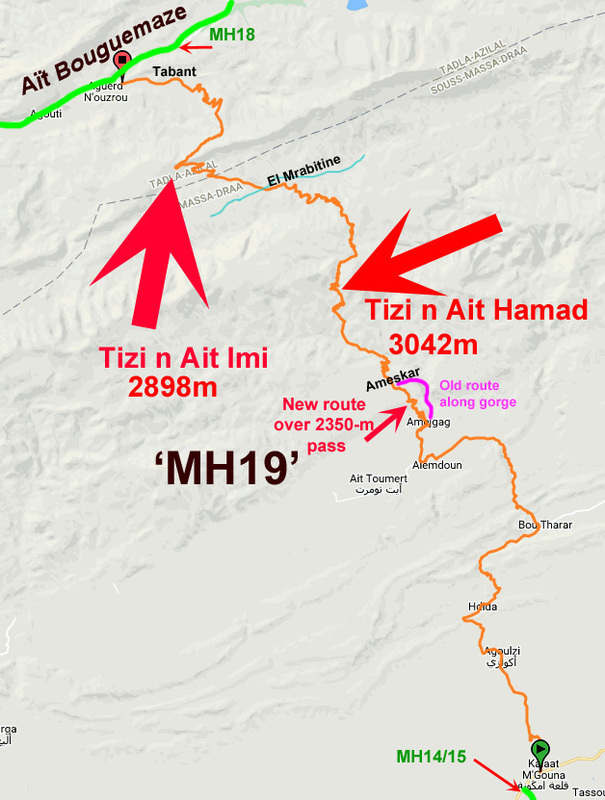 Now the steep climb begins to the 3042-metre Tizi n’Ait Hamad (~KM65). From the top of this pass (left; telecom tower; bloke in a hut) Jebel Mgoun summit (4071m; second only to Toubkal) is a 16km walk to the west. This was the rougher part of the crossing, but still smooth enough to be doable in a 2WD or a heavy bike. You descend from the Ait Hamad (above), climb an intermediate pass then descend into the valley of the Mgoun river, bypassing some remote villages of El Mrabitine. This descent is on a broader, metalled road, though it was still covered in loose gravel in 2017. You cross the Mgoun stream (KM83; ford) and climb less steeply to the Tizi n’Aït Imi (2898m; ~KM98). At the top Aït Bouguemaze valley lies 20km below. Near busy Tabant village (KM117) the tarmac resumes, with shops and basic bap cafes before you join MH18 (if heading west). As the whole area is popular with trekkers, there are several auberges hereabouts. There is a small Total just west of the Rose roundabout in Kella; the point where you turn north off the N10. At the Aït Bouguemaze end, the nearest fuel is either Azilal, 79km to the north via MH17 – a fabulous drop from the pine forests. Or stay on MH18 west to Demnate; 83km – about 90 mins of near-constant bends. Total fuel-to-fuel distance from Kelaa to either is around 200km, but there is drum fuel at the shop at the top end of Alemdoun. 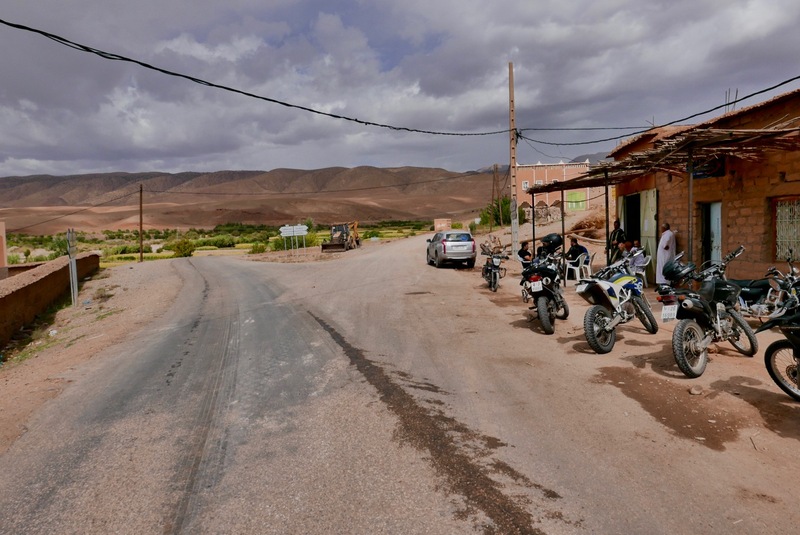 This entry was posted in Morocco Overland, Uncategorized and tagged ait bouguemaze, Alemdoun, high atlas, Jebel Mgoun, kella mgoun, MH19, morocco overland, Tizi n Aït Imi, Tizi n'Ait Hamad on July 17, 2017 by Chris S.